I want The Diligent Woman to be DYNAMIC in 2018. Words MEAN something: they create images in our minds. Words motivate. Did you ever think that maybe, just maybe, this is why God gave us His Word in written form? Just a thought. So, it is the end of the year. What do you do at the end of the year? Think about the coming year, of course. But first, it helps if you think about the year you are finishing. 2017 was a good year for The Diligent Woman. It had some ups and downs, but definitely more ups than downs. My word for 2017 was FOCUS. Boy, did I focus! I didn’t get that prayer study written (it’s on the plan for this year though) but I DID do TWO new Prayer Challenges that went great! But, I did improve upon my own prayer life and met some fabulous women who did the same. I didn’t read Launch or The One Thing again in total, but I did apply them to a new launch of the To Be a Handmaid of the Lord Bible Study Guide. I did better with my protocol for Chronic Lyme Disease with the help of CIR. So, I am on track to hit the most effective level of treatment in a couple months. I have plans for life after age 45 if I can kick Lyme out of it by then! Another daughter graduated homeschool high school. She had nearly two full years of college credit already on her belt too. The Fall brought a new school year – our third girl in high school and two in elementary. The high schooler is doing a project for school this year – building her OWN business. She is putting her love of baking and sewing into her business, Savory but Knot Bakery & Boutique. All of her English, Math, and Science will come through building the business. She’s learning history by studying business practices and learning about government regulations along the way too. I have focused my attention in the mornings towards school, so I have been more involved this year than I was last year. Win! The year ended with a great #write31days project that created the 31 Days of Women from Scripture Volume 2 series. We also created twelve new scripture writing journals called “Words on My Heart” and published them. Both the 31 Days of Women from Scripture Volume 1 and Volume 2 are now in published format, along with companion journals for both. A Diligent Woman’s Prayer Journal also made it into the published format. All projects that had been on my list for so long, but they got finished this year – because I focused my attention and stuck to my plan. 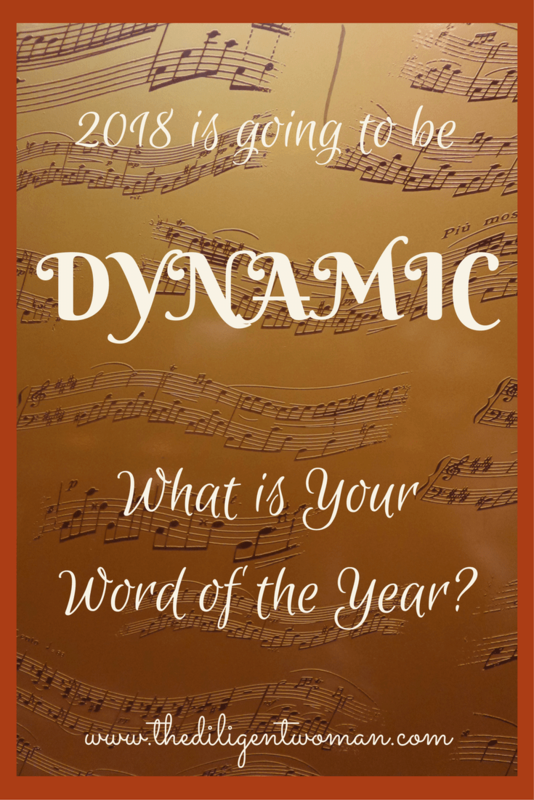 So, all of that FOCUS (and the growth from 2016) leads me to this year’s word – DYNAMIC. Stick with me for a minute while I explain my thought process here. Diligent, if you have not already noticed, is a favorite word of mine. In Deuteronomy 6:7 it says, “You shall teach them diligently to your sons and shall talk of them when you sit in your house and when you walk by the way and when you lie down and when you rise up.” God is teaching His people HOW to teach their children about obeying His commands. The Hebrew word that is translated “diligently” in this verse means to “to sharpen, whet; to sharpen, teach (incisively)”. I love that idea of sharpening by teaching. After all, God’s word is a sword (Heb. 4:12). It is a tool that we are meant to learn to use well (Eph. 6:10-17). Christians are meant to be changed by that word (Luke 8:15) and bear good fruit by it. In our English language, “diligent” means “characterized by steady, earnest, and energetic effort”. I want to BE that – thus The Diligent Woman. 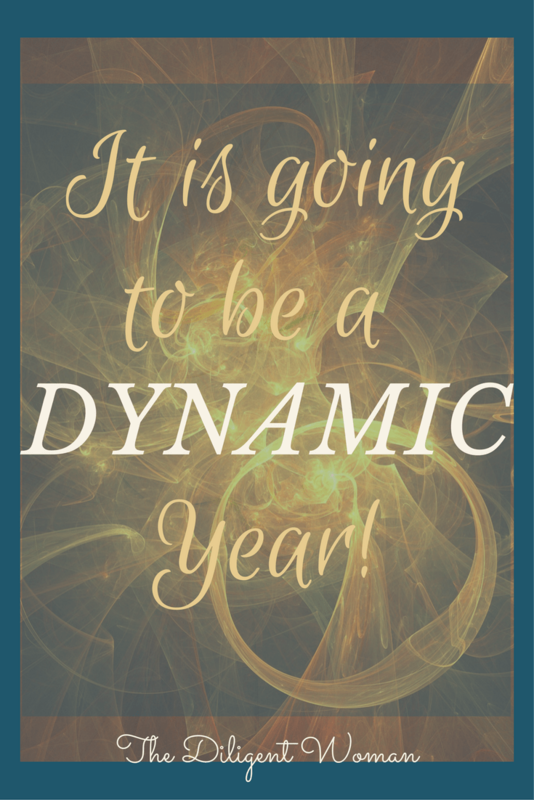 “Dynamic” can be used as a noun or an adjective, and means pretty much the same thing. It describes a process or system that is characterized by constant change, activity or progress OR it is the force that stimulates change or progress within a system or process. THAT is what I The Diligent Woman to be, or be described as, in 2018. I want The Diligent Woman to be DYNAMIC this year. learning even better how to plan for the different roles I fill and work that plan. 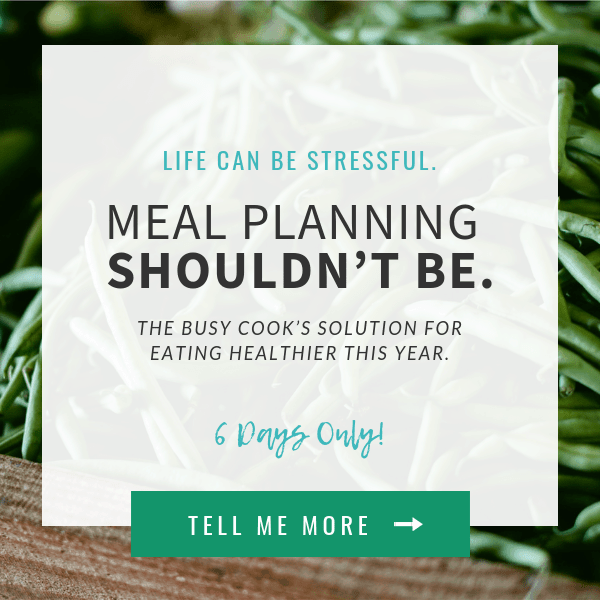 The question I have for you is – will you join me? Will you be the DYNAMIC that brings powerful change to those around you? In order to be the best woman, wife, mother, friend, daughter, or employee that you can be, will you grow in God’s powerful truths? Will you help me to encourage others in this effort? What can we change if we all step out with DILIGENT effort to be a DYNAMIC force wielding the most powerful DYNAMIC there is, the Word of God? Dynamic change doesn’t have to be HUGE in scope. After all, a small p over a bar of music creates a powerful change by bringing the volume of the music down, just a touch. It starts within me – within you – and the dynamic pushes forward to reach out to others. 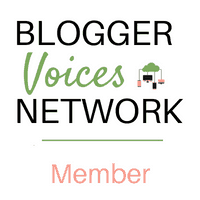 Want to know how you can participate? Do one, do them all. Your choice. Each one will serve as a dynamic that can bring change to the process of another woman’s life. I thank you now for any way in which you can help The Diligent Woman to be more diligent and to be dynamic for others. I’m looking forward to looking back over 2018, Lord willing, and seeing just how DYNAMIC sharing God’s word has been. Great goals…specific and purposeful. I, too, think 2018 is going to be a dynamic year!! Happy New Year! I love her stuff! 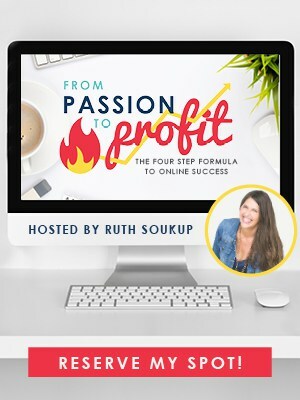 I use her Powersheets to reign in my idea overwhelm! WOW! You accomplished so much during your year of focus! What an inspiration! I too have tons of partially completed projects on my to do list… I need to get them checked off, so God’s truth can shine! Many blessings as you dynamically follow where God leads in 2018!